I’ll never forget the Christmas my mom got gout. I was planning to visit her house for Christmas dinner, but she called me Christmas Eve in tears. “You’ve got to help me! My foot ballooned in size, it’s hot, it’s tender to the touch, and it is KILLING ME!” she said. She had no idea what ailed her, but I had a pretty good idea it was gout. 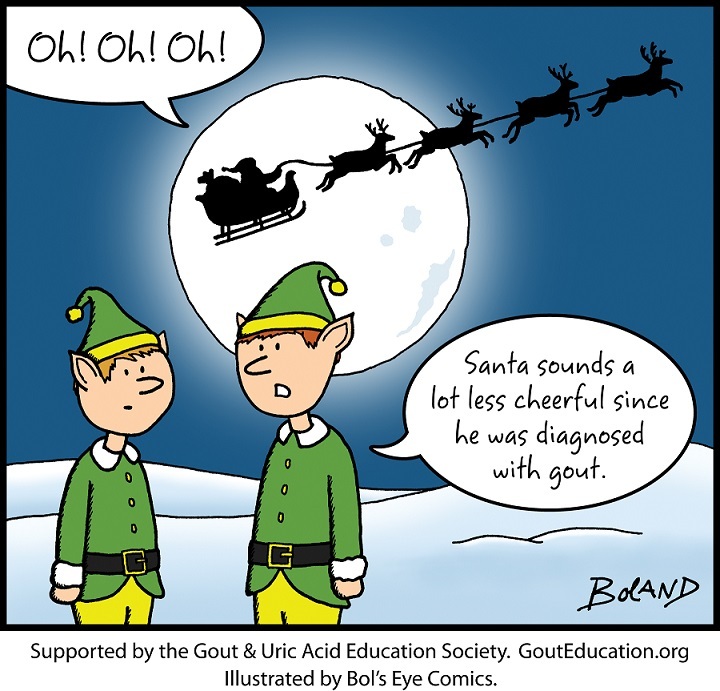 The holidays are the worst time to have a gout attack, but also the most common time. What Is Gout? What Are the Symptoms of Gout? What Causes Gout? What Are Common Gout Triggers? According to WHFoods.com, other foods to limit on a gout diet include: asparagus, bacon, beef, bluefish, bouillon, calf tongue, carp, cauliflower, chicken, chicken soup, codfish, crab, duck, goose, halibut, ham, kidney beans, lamb, lentils, lima beans, lobster, mushrooms, mutton, navy beans, oatmeal, oysters, peas, perch, pork, rabbit, salmon, shellfish (shrimp), snapper, spinach, tripe, trout, tuna, turkey, veal, and venison. To celebrate Christmas Eve, my mother had eaten a nice hearty meal of bacon-wrapped shrimp with asparagus and a glass of red wine. She couldn’t have picked a worse smorgasbord! Of course, not everyone who eats these foods will suffer a gout attack. Her friend who dined with her was just fine. Unfortunately, my mother had a lot of known risk factors against her. She suffers from obesity, type II diabetes, and high blood pressure. Hypothyroidism, dehydration, drug use, and alcoholism are other conditions that can increase one’s risk of gout. The hydrochlorothiazide water pills and low-dose aspirin she was taking have both also been linked to gout attacks. Cyclosporine, levodopa, and niacin supplements also have a gout connection, although my mother wasn’t on any of those. What Can You Do If Gout Strikes During the Holidays? Your foot doctor will most likely recommend short or long-term prescription medication to manage your gout flare-up. For chronic gout sufferers, prescription medication can be just as crucial as diet. The medical staff gave her diclofenac, an anti-inflammatory medicine that would work quickly. Indomethacin and colchicin are other similarly prescribed medicines. People who suffer from gout frequently may take allopurinol pills daily to reduce the production of uric acid. If you’re really in a pinch, over-the-counter naproxen or ibuprofen can take the edge off. Drinking plenty of water, resting the affected joint, and using cold compresses several times a day can also help, says WebMD. If this has been your first attack, don’t assume this will be the last. See a podiatrist to find out what you can do to manage your health! Half a year later, mom suffered another attack. This time her podiatrist told her about tart cherry juice supplementation. She’s been on it ever since and, thankfully, we haven’t had another attack. » Foot Fracture Fears: Help – I’m Too Young to Have Osteoporosis!